During a visit and tour of facilities at IITA Ibadan, His Excellency, Paul Lehmann, the Australian ambassador to Nigeria, accompanied by Hope Ayabina, the Public Affairs Officer Australia High Commission, praised the ongoing projects of the Institute and acknowledged that IITA has great promise for the world. Hillbur, IITA DDG Research (right), highlights major agricultural research activities at IITA. The visitors were received by Kenton Dashiell, DDG Partnerships for Delivery on 23 August. 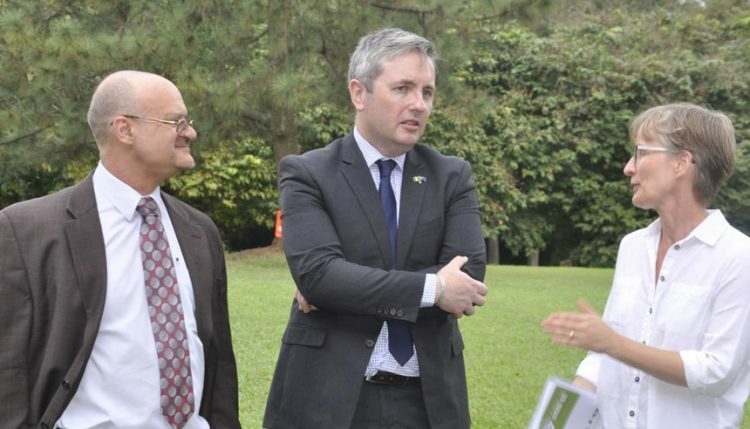 Lehmann said the mission to IITA aimed to strengthen the relationship between IITA and Australia and to explore how best the two parties can work together to enhance agricultural productivity in Africa. “Agricultural productivity is one of the key areas in which Australian Government takes as priority and IITA’s work in Agriculture has much potential to benefit not only Africa but other parts of the world as the effects of climate change and the demand for sustainable production are increasing everywhere,” he said. Dashiell through his opening remarks emphasized the need for proper government policies towards agricultural research. “When policies are great new technologies can get to the farmers. Howerver, if the countries do not care about agriculture and import all their food, there will be no hope for helping farmers,” said Dashiell. Lehmann also commended the technologies developed by IITA such as AflasafeTM, a biocontrol product, which protects crops from aflatoxin contamination and NoduMax―an inoculant for legumes that enhances yield of legumes. He also applauded the success of the SARD-SC project. The activities of the IITA Youth Agripreneurs (IYA) fascinated Lehmann. He congratulated them on their effort, and said the Agripreneurs are the future of Nigeria’s agriculture.